Not surprisingly, the retirement of the most famous Ocean Liner in the world (the QE2) in 2008 overshadowed the announcement that Fred. 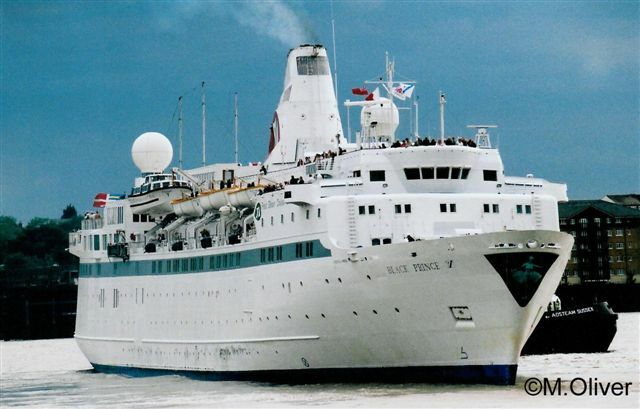 Olsen Cruise Lines will retire its vessel, ‘Black Prince’ in October 2009. Now the only things in common that these two ships have in common both are old and both are favourites with British cruising public. Although owned by the Norwegian Olsen family, Fred Olsen Cruise Lines offer a very traditional British experience. Initially it can be quite difficult to pinpoint the secret of Olsen’s success. Olsen does not operate modern state-of-the-art ships, in fact the fleet comprises of four aging ships. Their onboard facilities may seem a little limited in comparison to new ships, the food and entertainment can be good, but not always outstanding, and the fares are not particularly low. The secret is that Olsen are a family owned business. They operate a small fleet of ‘classic’ intimate ships which renowned for their friendliness and particularly appeal to the more mature Brit. The food and entertainment is aimed firmly at the conservative British pallet. The ships are easy to get around if you have limited mobility and are not overwhelming like most new ships. In fact many of the Black Prince’s loyal following would regard a 30,000 gross ton ships too big. The Black Prince is arguably the most unique of the current fleet. Black Prince was built by Flender Werft, Lubeck, Germany in 1966 (three years older than the QE2) and entered service for Fred. Olsen Ltd on 19th October. She had the role of a joint passenger/freight ferry operating between the UK and the Canary islands in the winter, and the UK and Norway in the summer. The ship was converted to a full-time cruise ship in February 1987. Part of the ship’s cargo hold was transformed into an indoor fitness centre with a heated pool, a large area for table tennis, badminton court and a children’s room. In addition a ‘marina’ is stored in the cargo hold which could be deployed via her stern doors and floated on the sea to be used as a ‘jetty’ for water sports. Aesthetically The Black Prince Is not a very attractive ship, in fact some may say she’s ugly. However clever photography is the Fred Olsen brochures, such as overhead images make her look acceptable. At 11, 209 gross tons and carrying just 441 passengers the Black Prince is 8-10 times smaller in volume than many modern cruise ships and carries a fraction of the passengers. There are no climbing walls, ice rinks, water parks, big casino’s, surf simulators, tiered theatre, lawns, parks or vast atriums. You don’t even get a wrap around promenade deck. What the Black Prince does have is three intimate dining rooms and three intimate lounges, a shop, card room and small Library. I recall Olsen marketing director, Nigel Lingard, saying that having such a small ship in the fleet allowed them to pioneer new itineraries without the risk of having to sell a thousand cabins. The Black Price experience can create very divided public opinions, as passenger reviews from the net clearly demonstrate: “Black Prince is a tired rusty old vessel that should have gone to the scrap yard long ago” and “My favourite very friendly no glitz – a proper ship”. Although many commentators have described the Black Prince’s public rooms as comfortable, many have also described her cabins as ‘outdated’. The Black Prince has of course not benefited from the regular multi-million pound refits that the QE2 has over her life. Many of her cabins are very small with drab 1970’s teak veneer décor. The outsides tended to be smaller than the insides and many had bunk beds. However her loyal followers have obviously been prepared to tolerate these shortcomings in order to cruise on a friendly intimate ship. A spokeswoman for Fred Olsen said that the introduction of new Safety of Life at Sea (SOLAS) regulations which come into effect in 2010 was largely behind the decision, but indicated that the economic downturn and increased fuel costs were also factors. She added that the number of modifications necessary to bring Black Prince in line with the new standards were economically unviable, particularly for such as small ship. The removal of wooden paneling throughout Black Prince’s interior – considered a fire hazard under the new regulations – was one of the changes required. Hi ken, she could of offered the same itinerary over several years. On the other hand, maybe not? Did you enjoy the BP? Thank you Tom. I know this website very well. Pieter, we must have crossed paths at some stage although I can’t remember when. I also worked on Black Prince ( and Blenheim, unfortunately!) as Shop Manager. I did my first round the world trip on Chandris Lines on the Australis while waiting for Fred Olsen’s Blenheim to be built. When Blenheim broke down soon after its maiden voyage (1970?) I went back to Chandris Lines, again as Shop Manager, this time on Ellinis for about two years, then after a six month holiday, joined SS Australis and stayed until 1977. I LOVED working on Chandris Lines, loved the Greeks and made many friends. I live in Australia now, but at the moment I’m back in Greece once more, catching up with many old shipmates from Chandris days. Sounds like exciting times Pieter! I hope that you never had to deal with any serious medical emergencies (or deaths on-board). After my experience on board of the Black Prince I went to Chandris Lines and worked on board of the Australis, Ellinis and Britanis. It was mainly sailing with migrants tot Australia and New Zealand. For a part there was cruising as well. Pacific, Carabean and Mediterenian. Thanks fr your quick reply. Pieter. Thanks Peter. Did you work on other Olsen ships or with other cruise lines?